Just prior to the outbreak of Second World War, Le Havre was bathed in a positive light by the many painters who portrayed it. Was it not the city of Impression, Sunrise, the most famous painting by Claude Monet? After it was bombed in 1944, Le Havre quickly studied the question of how to establish its new post-war reconstruction identity. In an effort to promote the modern image of this great city, the Délégation Générale du Tourisme commissioned a series of photographs from Lucien Hervé in 1956. But it would take almost 50 years before people truly began to view the city in a new light, when it was listed as a World Heritage Site in 2005. In the wake of this international recognition, the City of Le Havre and the French Ministry of Culture and Communication–CNAP decided to launch a new public commission. Five photographers (Véronique Ellena, Nancy Wilson-Pajic, Manuela Marques, Charles Decorps, Xavier Zimmermann) and a videographer (Pierre Creton) were asked to capture the city centre rebuilt by architect Auguste Perret. This quickly led to a resurgence of interest in Le Havre and other artists began to follow their lead. 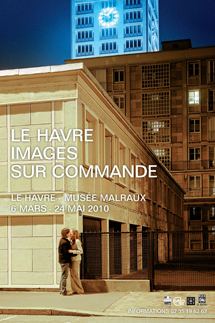 The exhibition comprises around a hundred works, a mix of the now-historic portrayals of Le Havre rebuilt and the more recent photographs that provide a renewed vision of the city. Moving away from the traditional street pedestrian shot, these artists have taken a more complex, personal and curious approach, as they crossed the threshold of buildings, explored their interiors, climbed to the rooftops and reached out to the people of the city. The most surprising viewpoints (from the 17th floor of city hall, perched on a firetruck ladder, from the apartments, etc.) reveal a fascinating spatial organization that makes subtle use of the effects of perspective. The city calls to mind a theatre set, as the effects of light—at twilight, night or the height of summer—bring out the sculptural quality of concrete. The artists capture the everyday and portray it as something extraordinary. They do not hesitate to stage strange scenes in which the city's residents seem to play their own role. They renew the city with its history and make it a space for remembering, imagining, dreaming and playing.